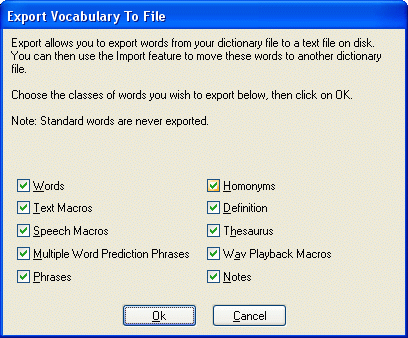 The Export Vocabulary dialog allows you to export custom vocabulary, macros, and extra word information that you have entered such as definitions or homonyms to disk so that you can easily transfer them to other dictionary files. This is especially useful for administrators, trainers and installers who set up macros and specialized vocabulary ahead of time to allow them to enter it once, then Import it into other dictionary files. Once you have chosen the items you wish to export, click on OK, you will be prompted to enter a file name to export to. Once you have done that a status bar will appear to let you know how the export is proceeding. Note: Export will not export any vocabulary that was in the dictionary when you received it, only words that have been added through use. Words that you have added will be exported. Note that if a word also has a Homonym, Definition, Thesaurus, Wav Playback Macro, Note, Text Macro or Speech macro and any of those checkboxes are checked, that that word will be exported regardless of this setting. Words that have a Text Macro defined for them will be exported. Words that have a Speech Macro defined for them will be exported. Phrases containing spaces that have been learned automatically will be exported. Phrases containing spaces that you have added in the Dictionary Editor will be exported. Words that have homonyms defined for them will be exported. Words that have definitions defined for them will be exported. Words that have thesaurus words defined for them will be exported. Words that have WAV playback macros defined for them will be exported. Note that you will have to make sure that the paths to .WAV files are correct if you have placed your .WAV files in a directory other than the \Program Files\Aurora Suite 2005 directory. Notes Words that have notes defined for them will be exported.